Did someone steal your video? With 2 billion monthly active users, Facebook is the most widely used social platform in the world. Whatever your business goal—awareness, leads, traffic—Facebook is most likely a part of your social media strategy. In fact, you're probably spending a lot of time creating Facebook videos to captivate audiences, but how much effort are you setting aside to prevent others from posting your work as their own? Not so long ago, I received a Facebook notification that someone had uploaded a snippet of my video, Facebook F8: What Marketers Need to Know, and was using it as part of their paid training without my consent. Fortunately, I had applied for Facebook's Rights Manager and I was able to claim ownership of my content and block the user from using my video for financial gain. With Rights Manager you too can take a proactive step in preventing others from infringing on your video copyright. To get started, all you have to do is apply for Rights Manager online. Applying is easy and takes less than five minutes to complete. If you manage multiple Facebook Business Pages like I do, then it might take you a bit longer since each client should have a separate emergency content. Rights Manager is for publishers that publish content on Facebook, and also those that don’t publish on Facebook, but want to protect their content. If for some odd reason, your application is denied, you're allowed to re-apply within seven days. If that doesn't work, try contacting Facebook Support directly via Messenger Chat. After my application was approved, I realized Rights Manager was not retroactive and that I had quite a few videos that I wanted to have monitored. To ensure that earlier videos of mine were protected, I had to manually add all of them to my Reference Library. Step 1. Go to your Business Page, click on Publishing Tool. Step 2. Under Video Library, choose which video you want to add and click on the gear icon. Step 3. Click on Rights on the right-hand menu. Step 4. Allow Facebook to detect matching videos. Monitor the match: allow the video to stay published and monitor its activity, including views and follows. Claim ad earnings: allow the match to stay published but claim a share of the money generated if an ad break runs during a video that matches your reference file. 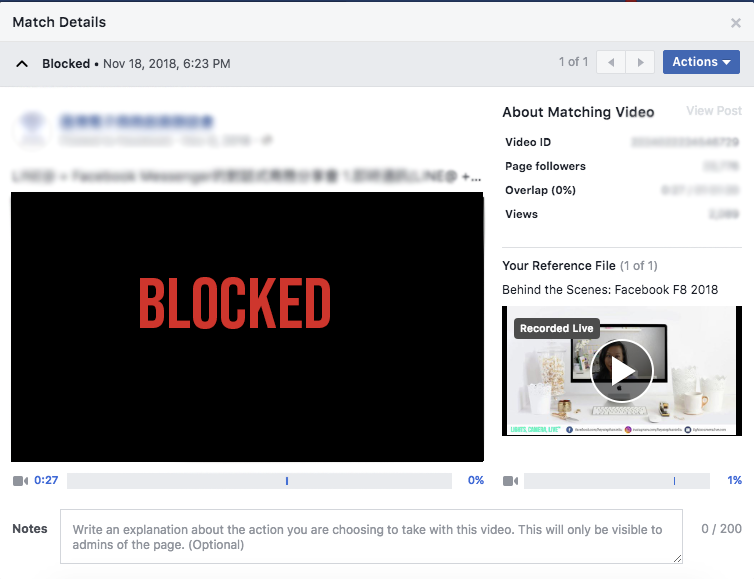 Block the match: prevent anyone from viewing the matching content other than the person who posted the matching video or admins or editors for the Page containing the matching video. Manually review the match: flag matched segments for manual review by your Page admins or editors; matched videos will expire from Manual Review after 30 days. What if your content is published privately, can you find out more? What surprised me the most about Rights Manager is that even if someone tries to publish your video in a Secret or Closed Facebook group, Facebook will still notify you! You won’t have access to information about who posted the video or where they posted it but you can still block them from using your content. If the infringer then tries to claim a dispute and agrees to a review, Facebook will then provide you more information about the video. In my case, I saw that the infringer claimed a dispute and I saw that he posted my video privately and it was dubbed in Chinese. I ended up having a friend of mine that is fluent in Chinese contact him to find out what he was trying to do with my content since he never reached out to me. What if they're making money off of my videos, can I claim those earnings? If the other party is using Facebook ad breaks to monetize your content, you may be able to use Rights Manager to claim the other person’s share of ad earnings. exclusively own the video and audio rights, you will be able to claim the entire ad earnings. own rights to either the audio or the video, but not both, you'll be able to claim half of the ad earnings. only own rights in a specific geographic region you'll be able to claim ad earnings generated in views in the geographic region where you own rights. Just remember that if you claim ad earnings for a video match, you have exactly seven (7) days to claim your share of ad earnings. If you try to claim the ad earnings outside of that 7-day window, you may receive a portion of the uploader's ad earnings, but it may not be the full share. In other words, be sure to check Rights Manager often and pay attention to your notifications. Someone is claiming ad earnings on my content! What happens if someone is trying to claim earning on content that you own? No worries, you can dispute the claim to your ad earnings within 7 days of receiving the email and notification. According to Facebook, "If you dispute the claim and the rights holder doesn't respond to your dispute within 7 days you may receive your share of ad earnings for the video. If you don't dispute the claim within 7 days, or if the rights holder rejects your dispute, they may be able to receive your share of ad earnings." For additional support with Rights Manager, you can connect with a support specialist through Contact Rights Manager. This will take you to a form where you can ask a question, report an issue or provide feedback about your experience. Liked what you read? Join my free Social Media Strategist group. Are people stealing your Facebook videos?